Statements of faith, are professions of what people believe to be true. Most churches and ministries have them. They are ways of summarising what the church believes to be the core or basic teachings of the Bible. Not everything that a church believes is found in their Statement of Faith, but the foundational truths are there. The relationship between a creed and the Bible. Sometimes you will hear a Christian say, "We have no creed but the Bible!" It sounds spiritual, but it isn't really true. The logical next question is, "What do you believe the Bible says?" The response to that question serves as that person's creed, regardless of what they call it. The statement, "No creed but the Bible" is the result of a misunderstanding of the idea of sola Scriptura. Sola Scriptura was a phrase used by the Reformers to say that the Bible must be the definitive authority for it alone is the inspired Word of God. This was in contrast to the Catholic Church's doctrine that the Church and its traditions carried equal weight with the Bible. The Reformers argued that the Bible alone carried authority and that the church's interpretation or traditions could be in error. At the same time, the Reformers knew that it was foolish to dismiss the faith and understandings of centuries of believers. They knew that people need accurate summaries and statements of the faith. Because these statements tell us how others have interpreted the Bible, they can be meaningful guideposts along the journey of interpretation. If our understanding of the Bible doesn't match the Creed, we need to carefully go back and see if we are in error because our conclusions do not match those of other believers. Usually, we will find that we are wrong. Sometimes, however, we will discover that the doctrinal statement isn't supported by the Bible. In that case, the doctrinal statement needs to be changed. The earliest creed or Statement of Faith is the Apostle's Creed. We have no way of knowing who wrote it, but it has its origins in the first couple of centuries of the church. So it is old. In a world without the printing press or internet, it was used to teach and train new believers in the central beliefs of the Bible. It has proven to be such a good summary of major doctrinal points that it is accepted by all major churches and continues to be used today. The Apostle's Creed is important because it forms a basic answer to the question, "what do Christians believe?" I want to take some time to explain the significance of the statements in the creed and, more importantly, to highlight some of the biblical passages that support them. From the opening sentence to the very last verse, the Bible boldly proclaims that God exists. In a world that mocks or dismisses the idea of God, the existence of God is a radical idea. But the foundational truth of the universe is that God is. And he is glorious and awesome. He is eternal. He had no beginning and will have no end. The Bible simply assumes the existence of God. The opening lines of the Bible are "In the beginning God..." It does not lay out a philosophical argument for the existence of God. Instead, it simply explains that God is the creator of everything that exists. He is its cause. We can categorize things in many different ways, but the most basic way of categorizing things is "Creator" and "Creation." God is the Creator and all else is Creation. What existed before Creation? Only God. 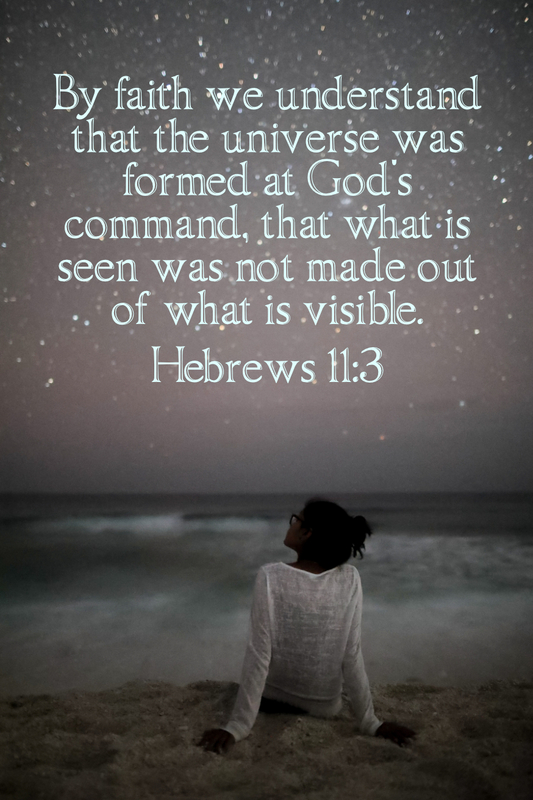 The Bible declares that God created everything out of nothing. The opening chapter of Genesis states that God commanded and things came into existence. This is affirmed by Psalm 33:6, 9 which says that the heavens were created by the spoken word of God. The closing book of the Bible also declares that all things were created by and for God (Rev 4:11). This specifically rules out a number of ideas. First, it rules out the idea that god and creation are the same things. This idea, usually called pantheism, says that there is no difference between the creation and creator. God is, according to the pantheists, everything that exists. This is clearly non-Biblical, but is an idea common in eastern religions and their new age counterparts. The more common unbiblical idea is that of materialism. Materialism holds that the material world is all that exists. There is no God at all for the materialist, although they acknowledge that the concept of God was "useful in more primitive societies." Materialism and the Bible are clearly incompatible. 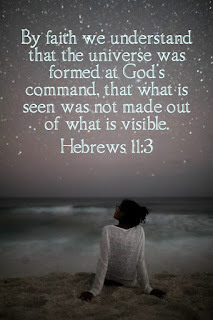 The Christian rejects any theory of the origin of Creation that does not include the Person of God willfully and purposefully creating all things in the universe. The Christian also rejects any theory that holds that what exists came about merely by random chance. The Bible teaches that God was actively and intentionally at work in the creation of the world. Much of Western culture today is influenced by materialistic thinking. This is one reason that science and religion are seen to be in conflict with one another. Historically, this is not been the case. For centuries, the basis of science was the thought that God created the universe and as a result, it was orderly and could be explored and studied. There have been disagreements between the ecclesiastical understanding of things and new scientific discoveries, but this does not mean that there is a contradiction between biblical Christianity and modern science. God has revealed to us that he created the world intentionally and with the purpose of declaring his glory. We are not here by accident. We are not the product of random chance. We, along with all of Creation, were fashioned by and for God himself.